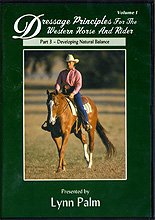 Throughout this DVD are a great variety of lessons. Turns on the forehand, turns on the haunches, yielding and backing teaches the horse and the rider elementary control of the horse's body position. Many different patterns are used to build your horse's basics without resistance; simple transitions, teaching correct leads, beginning bending and turning aids. A snaffle bit is also introduced. This stage of training is most important to develop your horse's natural balance, movement, and self carriage in all three gaits, according to his conformation. If your goal in training your horse is to build a long-lasting horse in whatever performance you plan, this stage of training, DEVELOPING NATURAL BALANCE is required! Your horse relaxes, lowers his head and neck, slows his mind, and learns to trust his rider. He is now ready to advance his training happily and with natural balance. LYNN RECOMMENDS: This series is recommended for all riders regardless of skill level or riding interest. Part 1 will assist the beginning rider in finding his balance or the more advanced rider in achieving perfect balance. Part 2 will hone the riderâ€™s aids communication including the use of the seat, leg and rein aids. With the proper use of the natural aids, the horse will respond with lightness, acceptance and confidence. Parts 3, 4 and 5 apply to training a young horse under saddle or retraining an older horse to respond with more confidence and control. Part 3 is a great introduction to taking proper leads and the canter itself. Part 4 is great to improve transitions and speed control in all three gaits. Part 5 will begin and advance collection with lateral training, counter canter and simple and flying lead changes. Dressage Principles for the Western Horse and Rider demonstrates the epitome of Palm Partnership Trainingâ€”using Dressage Principles for all breeds of horses and all levels of riders.